On Fame War we have plenty of Bonus systems, like our Daily Rewards, Collector Field, Tokens etc. And one of the biggest rewarding Systems is our Online Bonus, you will find that in the upper left corner of your flyff window. A small grey buff with a green arrow on it, if you hover over it with your mouse you will get some informations about it. For every hour you stay online you will get a bonus of 5% EXP, the maximum EXP amount is 25% EXP which is reached after 5 hours. 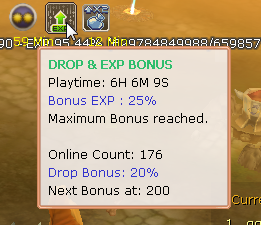 If you log out the EXP Bonus is gone, switching to another map/world will not take away your EXP bonus. Right below you can see the User Online Rewarding System, the Drop Rate will raise with the User count. So the more Users are online, the higher the Drop Rate will be! The Drop Rate Increase does affect the overall drop of items a lot more than anything else! The Next Bonus is our Online Token Reward System. For Every hour you stay Online you will receive 1 Token. You can buy many Usefull Items for these Tokens, Such as 10% Card and (S) Card Boxes, Rock Paper Scissor Coupons where you can win Q Amps and even More cards! You can get Lord Set with Statts and also Buff Pets, Custom Scrolls and many more! Go to the Flaris Mayor to buy items for your Tokens and also to Play Rock Paper Scissor Game.